I live about 30 minutes outside of San Francisco and usually when I visit the city, it’s typically chilly, cloudy and windy…but today was beautiful. 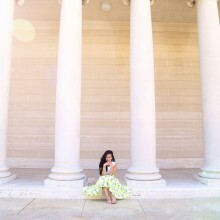 The sun was warm and the weather was just perfect at the Legion of Honor. It was our first time here and I can’t believe I never checked out this gem because it’s such an amazing place with so much history and has a beautiful backdrop for photos! We spent most of the day here shooting for my new Floral collection. This set is one of my favorites. The pink floral print is very feminine and delicate, but as a mini skirt with a fully flared shape and a playful crop top, I think it’s perfect for summer! I’ve been trying for ever to find one that i like and fits. I love me some matchy matchy! These are so cute together, I always love the shape of your crop tops, very wearable! 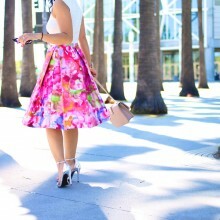 Not to mention, i am a floral LOVER! You look so beautiful, I love the mix of those dainty, feminine silver shoes, perfect touch. Your first picture belongs in a magazine…. You look SO pretty. Such adoration by everyone is well-deserved. Girl, you are seriously so pretty! I love this dress on you. It’s beautiful!! Omgosh this outfit is so cute!!! I am so ordering this! Btw – I love your hair like this, the soft loose waves. You look so pretty! WOW, what a cute outfit!! These photos are amzing and that top/skirt combo is perfection! I love your co-ord set, the print is so vibrant and summery and I adore your skirt. The cutout at the back is amazing and I love that you went with silver heels.